Add 1/4 cup sugar and a large pinch of salt. You want to reduce it until you have approx 300 ml left. The end colour and texture will vary depending on the soy milk you use, ! have found, in my experience. For example, the browner condensed milk pictured was ASDA sweetened UHT soy milk, but the lighter colour shown in the Version 2 condensed milk was ALDI soy milk "Acti-Leaf" and was a different colour, and I preferred the look of it, although they both tasted just as nice! If you want to add the margarine to keep it more viscous (rather than it becoming more set) then stir it in now. Chill and let it thicken- and now, it's ready to use as a condensed milk to make something else! What an amazing recipe! I wonder if there is something the margarine could be substituted with, maybe coconut oil. You actually could leave out the margarine step. When the Soy milk reduces down, it almost forms a kind of custard suddenly, and the margarine mixed through at the end helps it stay more viscous. 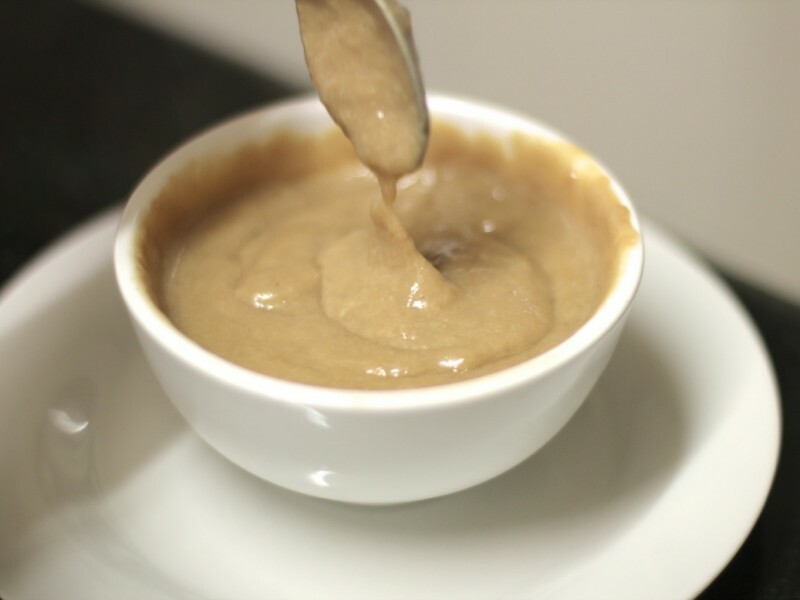 However, as the condensed Soy milk most likely will be used to make another dish, the final look of it is not so important,and when you reheat it it will become a little smoother, so you could either skip the fat altogether, use some coconut oil as you suggested or even a drop of veg oil. Or, you could try putting the custard textured soymilk into a blender and giving it a whizz to break up the bonds and make it smoother without the fat. You could also up the amount of sugar in it too, to make it more syrupy. I have only included the minimum, as it is sweet enough in this form to them be used in a cookie or a slice. Them ost improtant bit is to keep breaking up the surface area as it slowly reduces from time to time so you don't get the skin forming on the top if the milk. I use a whisk to froth up the surface, and then can leave it and get on with other things for a while before returning to re foam the top to avoid the skin. Do you think you could make a cheesecake from this? as in non vegan cheesecakes call for condensed milk, if this is made do you think it could replace the non vegan one? I would have to have a look at the recipe and see what else is in it. I have never used condensed milk in a cheesecake before. The dairy Condensed milk is very heavy and sticky. The soy one is a bit less so, but then again, I haven't loaded this one with sugar... If adding more sugar it would become more like that. If you have a link for a recipe, let me know and I'll have a look! So far, the vegan cream cheeses I have tried, go a bit runny when you whip it, whereas I remember the dairy ones being more solid and fluffy. I looked at a few recipes online that ask for condensed milk in a cheese cake, and without extra processes and ingredients I don't think it would work, mainly because of the Vegan cream cheeses actually. As I mentioned, the ones I have tried so far become runny, and don't re-firm up once whipped. The condensed milk would certainly add a richer flavour to a cheesecake though. Which version would be best for caramel slice? It require adding equal parts brown sugar and sweetened condense milk. I usually use canned but years ago I made my own and wanted to try one of your recipes. Use version 2- its sweeter, so better for a slice!